I've just set up an Active Directory Domain Controller (running Samba 4), created users, shares, groups, etc and everything is working. However, I have an environment where the use of roaming profiles is wanted. I can change the profile path for each user (e.g. \SERVER\PROFILES\%USERNAME%) but how can I make this the default for all accounts (including newly created accounts). I haven't found anything on this topic and I'm wondering why nobody wants to set default profile paths for all users with no exception. Your most suitable solution would be to use group policy. Using group policy will allow you to apply a standard path for all computers. 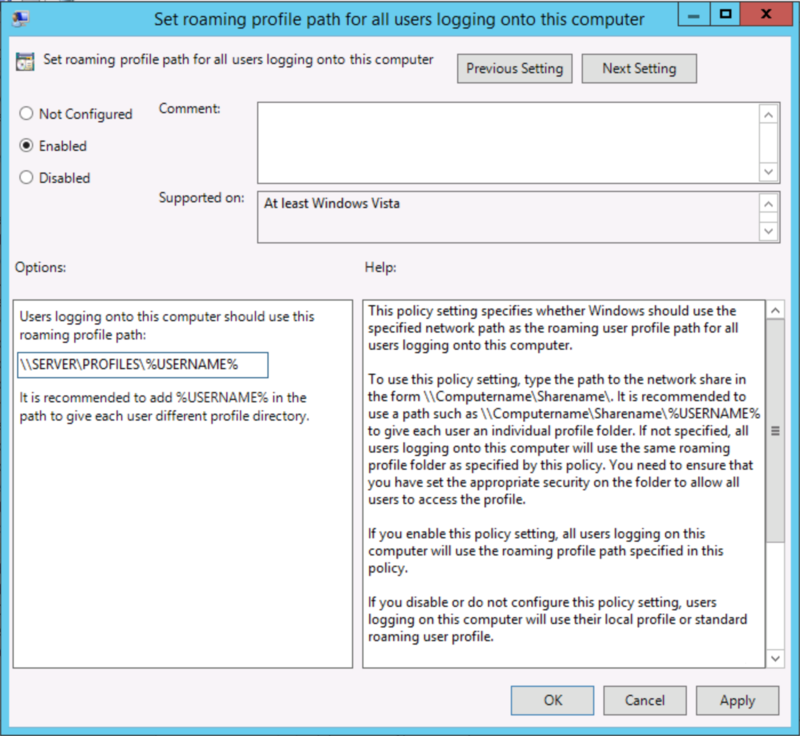 Launch 'Group Policy Management Console' and locate the policy called 'Set roaming profile path for all users logging onto this computer'. This is located under 'Computer Configuration\Policies\Administrative Templates\System\User Profiles'. Not the answer you're looking for? Browse other questions tagged active-directory group-policy samba domain-controller or ask your own question. How to use Active Directory's homeDirectory attribute for Samba?